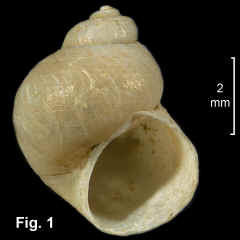 Description: Shell lightweight, spire relatively tall, whorls strongly convex. Aperture semicircular, white internally; outer lip simple. Umbilicus deep, with inner lip of aperture partly reflected over it. Shell surface with irregular axial growth lines. Colour light grey or fawn, without spiral bands. Distribution: Endemic to Australia. In NSW, presently known from Botany Bay and Hawksbury River (Church Point). In Qld, known only from Moreton Bay. Probably more widely distributed in NSW. Habitat: Occurs in the upper littoral zone in estuaries, on open sand flats, with or without sparse mangroves present; rarely on mud or under dense canopy cover. Sometimes found crawling just beneath the surface of sand, with a raised trail behind. Comparison: With a maximum height of 6 mm, this species is smaller than Salinator tecta and much smaller than Phallomedusa solida. In shape it is more elongate than S. tecta, and similar to P. solida. In colour it is uniformly light grey or fawn without the spiral bands of S. tecta and without the pattern of axial lines of P. solida.